To prepare for the launch of Daydream, we have seen a slew of apps go live in anticipation for Google's take on VR. Headsets for the new platform should be available starting tomorrow, November 10. Not looking to be left behind, YouTube has made its entry into virtual reality available today. 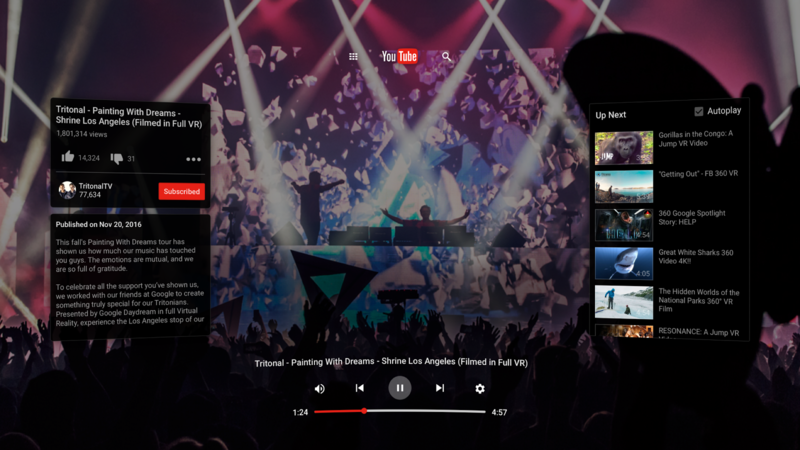 Much like other apps of its kind, YouTube VR will let you "step inside" the world of the largest video hosting site. Here you can watch 3D 360-degree videos or the standard rectangular ones, even from the channels you subscribe to. You can immerse yourself in the three-dimensional content or you can watch the standard clips in a "theater mode". Discovery and search can be accomplished either through voice or a keyboard. Much like the standard YouTube app, you will also be able to watch and browse simultaneously. This being an initial release, a few bugs are very likely (this is YouTube we're talking about here). The app is available to download from the Play Store or over on APKMirror. Go check it out if you have a Daydream headset on the way (or in your hands).